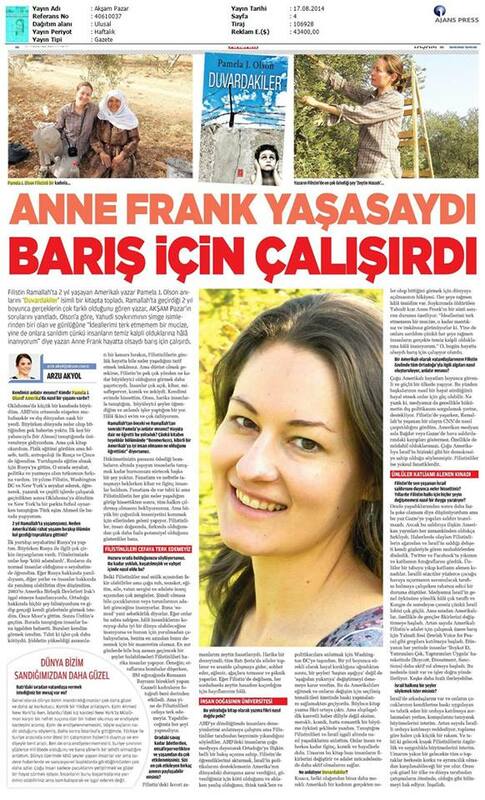 My book was just published in Turkish as Duvardakiler, or “People of the Wall.” My Turkish publicist scored me extensive interviews in three major Turkish newspapers. The first was with Aksam. You can read it online here, but of course it’s in Turkish. The English version is below. Can you tell us about yourself? Who is Pamela J. Olson? What kind of a life does she have in the USA? I am from a small town in Oklahoma, a relatively conservative and isolated place in the middle of the US. I didn’t know much about the world growing up. The first time I met a foreign person (a German), I was in college. But I read a lot of books, and by the time I got to college I really wanted to learn more. I studied mostly physics but also philosophy, history, anthropology, and the Russian and Chinese languages, and I traveled to Russia to study abroad. I realized I had a passion for travel, politics, and writing. After ten years of traveling, learning, writing, and working various jobs in Palestine, Washington, DC, and New York City, I’m back in Oklahoma (at least for the next few years) living with my Turkish husband, Ahmed. We met while playing soccer in a park in New York City. You lived 2 years in Ramallah. What were the emotions that brought you from America to Ramallah? Why did you leave the comfortable life in America and go to a land where death was everywhere? My first trip abroad was to Russia. I had a nasty stereotypical view of Russians growing up because they were always the “bad guys” in our movies. But I found Russians themselves just as human as anyone else, fascinating and funny and mostly very kind. I realized if I was so wrong about Russia, I might also be wrong about other places and peoples. In 2003, when I was saving money to travel again after college, the United States was getting ready to invade Iraq. I knew nothing about the Middle East, but I had a feeling my government was hiding things, because the propaganda sounded ridiculous. It didn’t seem logical that millions of human beings “hated us for our freedom.” I wanted to go to the Middle East to find out the truth for myself. It helped that I had Lebanese friends who talked about Lebanon like it was the most beautiful place on earth. I went to Egypt first because another friend wanted to meet me there for his summer vacation. After he left, I was in Jordan on my way to Lebanon when I met some people who had been to Palestine and told me about the occupation. The things they told me sounded unbelievable—and they also said the United States government was paying Israel $3 billion per year—so I wanted to find out if they were true. Of course, things were worse. It’s almost impossible to describe what Palestinians have to go through just in everyday life, not to mention during escalations of violence. But to be honest, even more surprising was how amazing Palestine was in so many ways. People were so open and kind and hospitable and funny and intelligent. More than half the people I met spoke English, even in small villages. Somehow I felt at home. I still think of it as a second home, and I miss it all the time. It was a place where I could meet amazing people, live in a beautiful land, learn about fascinating things, and do meaningful work. What more could I ask for? There is nothing more humbling than meeting people who live under bombs that your government pays for, expecting to find extremism and hatred, and instead finding some of the kindest and most interesting people you ever hope to meet. Extremism does exist, of course, but after seeing and feeling what Palestinians go through every day, you honestly expect the whole population to have gone crazy. Yet the vast majority are doing everything they can not only to keep their humanity intact but also to welcome outsiders and strive toward life and freedom despite terrible odds. I have never felt more welcome anywhere else in the world, and I have never felt more humbled and inspired by people. Palestinians showed me there is more potential in human nature than I ever realized. You have said that in this hectic world, you found a kind of peace in Palestine. How did you find peace among all that poverty, suppression and atrocity? Palestinians may be poor in possessions, but many are rich in spirit, kindness, education (which is very important to Palestinians), family, love of land, and belief in justice — if not now, then in the time of their children or grandchildren. They call it sumoud — steadfastness. If they can have this patience and endure these hardships and still maintain their humanity and believe a better world is possible (and work toward it, tirelessly, in a million ways that we mostly never hear about), I feel like I have no excuse not to at least try to follow their example. Palestinians are also amazing in the ways they enjoy their time even in the most difficult days. There’s a picture, for example, of women in Gaza making special Ramadan Eid pastries at a UN shelter even as bombs were dropping around them. It touched me very deeply. It’s a lesson that if you’re not enjoying your time, if you’re not maintaining what brings joy to you and others, everything else is meaningless. And it’s a reminder that life strives to exist and thrive, even when outside forces try to destroy it. But still, Palestinians shouldn’t be asked to endure so many hardships. We can’t abandon them to it. We have to do what we can. What was your motivation to write “Fast Times in Palestine”? What made you write this book? When I came back to the US after living in Palestine, I tried to tell people about my experiences, and no one wanted to listen. They said I had somehow been brainwashed by the Palestinians, even though I was talking about things I had experienced personally. Many people in the US have a certain vision of the Middle East based on the media, and when you imply that everything they believe is wrong, it tends to make them upset. I moved to Washington, DC, to try to speak with think tanks and policymakers about what I had learned in Palestine and how supporting Israel’s policies, even when they are brutal or illegal, is bad for America’s standing in the world, bad for our security, and morally wrong. While some individuals were willing to listen, institutions tended to be systematically pro-Israel, largely due to the Israel lobby. After a year of being constantly frustrated, I decided to stop trying to change things “from the top down.” Instead, I decided to try to change things “from the bottom up,” which meant educating Americans and urging them to put pressure on their elected representatives to change. Most humans are good people, and that includes Americans. We just need the correct information told to us in a way we can digest and relate to. So that was the idea of writing a book about Palestine. But not in the usual depressing journalistic way. Instead, I wrote it as a suspenseful, funny, even romantic coming-of-age narrative that, along the way, shows and tells about the Palestinians I met and what their life is like under Israeli occupation. Palestinians aren’t saints, by any means, but they also aren’t devils. They are humans, just as interesting and funny and full of dreams as anyone else. I wanted to show that side. I hope it will change some people’s minds and inspire them to learn more and become active in the struggle for justice. What does “Fast Times in Palestine” tell? What will readers find? In essence, it is the story of an American woman — rather average, though maybe more curious than usual — going out into the world to see what it’s really like. I could have ended up in Iraq or Kashmir or Tibet—there is no shortage of struggles all over the world—but I ended up in Palestine, where I found so much beauty, so many questions, so much horror. In the book I call it a “university of human nature.” I wanted to learn as deeply as I could. And I found, of course, that it’s bottomless. But ultimately, in the end, still hopeful despite it all. I like to think if she were alive today, she would be working for peace and equal rights for all. How are other Americans’ perceptions of the Middle East formed through the Palestine issue? Are these perceptions correct? How do Americans understand things that happen there? Do you think they are sensitive enough? Most Americans have lived all their lives in a secure and powerful country, so it can be hard for them to imagine what other people’s lives are like. Our military-industrial complex is powerful, and it has an interest in promoting conflicts that give it more power and money. As a result, it’s easier for a war-maker to come to power in the US than a peace-maker. Sadly, our news media often supports the government line on foreign policy instead of challenging it. The Israel/Palestine situation is one of the most distorted issues in the American media. When I was living in Palestine, I would often see something happen in Ramallah, then go watch a report about it on CNN, and it would be nothing like what I had just seen. It often missed the point entirely. And unlike Al Jazeera, the American media never shows the casualties of air strikes in Baghdad or Gaza. So most Americans don’t understand the true realities of the conflicts in the Middle East, especially the ones we are involved in. Most Americans are also told that Israel is a democracy like us, with a Western style of life, while Palestinians are impoverished extremists who are nothing like us. Which makes it sadly easy to dehumanize Palestinians. And when your media dehumanizes people, it’s hard to be as sensitive as you should be about their suffering. As far as we understood from the book, you were impressed by the traditions, hospitality and life there aside from the war. Can you share some of your memories that affected you most? My favorite times in Palestine were the olive harvests. It’s such a wonderful occasion, with the entire West Bank gathering their families and going out to the land to work and talk and laugh and climb trees and have picnics. I wrote about olive harvests extensively in the book. Every single fall, if I’m not in Palestine, I feel sad that I’m missing the olive harvest. I also fondly remember the Taybeh Octoberfest, a beer festival in a small Christian village near Ramallah. They have a brewery and make a delicious beer that is enjoyed in all the major Palestinian cities and even in some places in Israel. The festival always gathers Palestinians from all walks of life (they have a non-alcoholic beer for observant Muslims) as well as thousands of foreign tourists to get a taste of Palestine when it parties. There are very interesting, very real characters in your book. What have these encounters added to your life? Are you still in contact with any of them? I am in touch with most of the people in the book. Qais, the young man I had a sweet relationship with, is happily married with two beautiful children. Rania also has two lovely children, and we Skype every couple of weeks. On a recent book tour in Canada, I visited the Canadians I was with when we were held at gunpoint by Israeli soldiers in Ramallah. I feel very lucky to know all these people. What would you like to say about the role of the West, as a Westerner who lived in the region for 2 years? The Sykes-Picot Agreement of World War I was a colonial power grab by the British and French, with much of the Middle East carved up in the interest of “dividing and conquering” rather than making life better for the people who lived there. Many sectarian conflicts today were born from that legacy, including the Palestine/Israel conflict, which arose when European Zionists interpreted Britain’s Balfour Declaration of 1917 as permission to begin building a state in Palestine that would be dominated by European Jews. I believe Jewish people deserve a home and safety as much as anyone else. But no people would accept to be kicked out of their own homes and land by outsiders to solve a problem they had nothing to do with. That’s the root cause of this conflict. Unfortunately, the West has continued meddling since then, usually in destructive ways. In 1953, British and American forces overthrew the democratically elected Mossadegh government of Iran when he tried to nationalize Iran’s oil. This led eventually to the revolution in 1979. The US funded Iraq during its war with Iran, which prolonged a bloody conflict and cost tens of thousands of lives, then later sanctioned Iraq, which led to the deaths of hundreds of thousands of Iraqis, an act of collective punishment. The 2003 war in Iraq was a brutal series of embarrassing blunders based on lies. It still shocks me to think my own people are capable of such barbarity and stupidity. Many Americans are very ashamed of that war. All Americans should be. And for decades the United States has supported almost everything Israel has done, no matter how wrong, which caused Israel to become more belligerent, stealing more land and punishing innocent people, helping create more extremism in the region and beyond. This is not good for the Israeli or Palestinian people, in my opinion, or for Americans. In short, I’m deeply embarrassed by the role Western governments have played in the region overall. But there are many good-hearted people in America and Europe, and I hope more Westerners will learn about the region in a truthful way and pressure their representatives to have a more productive role that treats all lives as equally valuable. Do you have any message that you would like to give to common citizens in the West? The world is, in general, so much nicer and less scary than we’ve been led to believe. Funny story: When my husband Ahmed was in New York, his sister in Istanbul read a story about an anti-Muslim hate crime in New York and called her brother, worried. He told her not to worry—crimes happened, but they were very rare. When I went to Istanbul later, my mom heard about cross-border violence between Turkey and Syria and called me, worried. I told her not to worry—the Syrian border was hundreds of miles away and no threat to me at all. There are people doing bad things in the world, but they are far less common than we would think if we only watched the news and its sensationalistic headlines. Most people simply want to educate their kids and live a nice life. We can help people do that, but not by bombing, conquering, and occupying nations we don’t understand, or by telling defenseless populations to vote and then punishing them for voting for the “wrong” party. Instead, we should try to really understand each other, see the humanity in each other, and realize that at the end of the day, most of us want the same thing: a stable, peaceful world where everyone has a chance to maximize his or her potential to contribute to their community and culture, both locally and globally. Increasing numbers of people, including Palestinians, want nothing more than their rights under international law. The US should support international law instead of undermining it, in the interest of peace and security for everyone, including ourselves. America and Europe have tremendous potential to do good in the world. Despite all they’ve done, few people actually hate them. People just want them to live up to their own ideals and laws. In the US, because of campaign finance laws, it’s very difficult for peacemakers to gain power in Washington. Changing those laws so that wealthy corporations and special interests have less power would be an excellent place to start. How did you feel when you heard about the recent Israeli attacks on Palestine? What does it feel like that nothing has changed for the Palestinian people after all these years? I thought I couldn’t be shocked anymore, but the assault on Gaza this summer was unbelievable. Gazans are mostly refugees, mostly children, mostly defenseless. And this latest escalation was deliberately provoked by Netanyahu to prevent a Palestinian unity government that might be more representative of Palestinians. Netanyahu has never had any intention of negotiating fairly with Palestinians, and he sees a unity government as a threat to his rejectionism. To besiege people for nearly a decade, then deliberately provoke rockets on a dishonest pretext, and “retaliate” by creating an apocalypse where nearly 2000 human beings were killed, including 400 children, and tens of thousands left with no homes, no jobs, nothing… It’s beyond words. But it was interesting to watch the American coverage of this assault, which was quite different than usual. We actually heard from Palestinians on the news, and from journalists who saw for themselves the horrors Israel unleashed, which in some cases were even more shocking than scenes they had witnessed in Syria. On Twitter and Facebook, we saw pictures of destruction and carnage, and celebrities began to break the taboo and publicly condemn the slaughter. Israeli spokesmen were in the uncomfortable position of trying to defend blowing up hundreds of children, and commentators weren’t quite as willing to accept their dishonest talking points. Our media is still very biased toward Israel’s overall narrative, and our Congress is nearly hopeless because Israel has such a powerful lobby and the Palestinians don’t. But ordinary Americans, especially young ones, are starting to change their minds, and increasing numbers of American Jews are disillusioned by Israel’s policies and joining groups like Jewish Voice for Peace that work for justice in Palestine. People all over the world are becoming active in the Boycott, Divestment, and Sanctions movement. Turkey does a huge amount of trade with Israel, so there is of course potential for Turkish people to get involved, too. So there is hope, and things are moving in the right direction. I just wish they would move faster. I have friends in Israel, and I want their children to grow up knowing their neighbors instead of being forced to join an army that oppresses and provokes them. (Increasing numbers of Israelis are refusing to join the army, but it is still a small number overall.) And of course, I want the next generation of Palestinians to grow up with freedom and dignity. I hope some day soon all of the land will be a place where all are welcomed without fear or discrimination. It’s a beautiful land, and it deserves to be known by the world as itself, beyond the context of conflict. Inshallah. Wonderful interview. I recommend your book to all I meet and also will send this thoughtful discussion on to my friends. Pamela, you are making an impact on the world regarding Palentine. After Turkey, other countries will follow. Your capacity,presence and passion behind the podium or on paper is beyond equal for me. To the un initiated the disconnect is unbelievable. I speak, but few listen and I want to do, but each thought comes with it’s own 25′ wall. You give all of us courage and hope. Still, I fear as I pray that should a peace agreement be forthcoming, it will truly both de militarize and dis occupy and not simply serve as another inevitable recipe for failure and the usual singular blame. As always,best wishes.